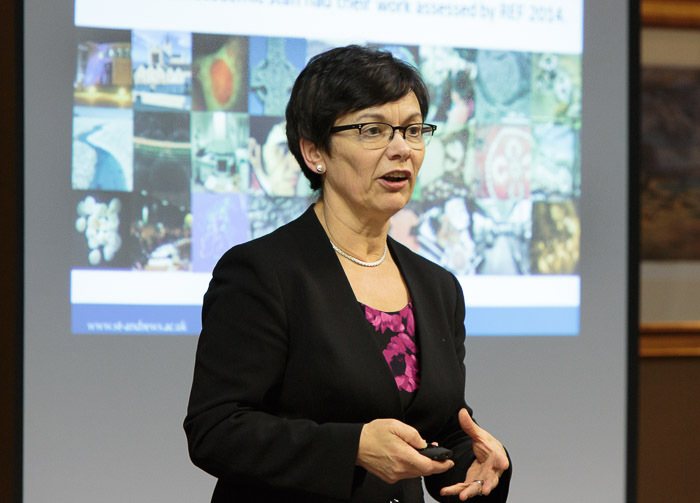 Professor Verity Brown, Vice-Principal (Enterprise & Engagement) at the University of St Andrews was the speaker at the November 2016 evening meeting of the Club. Verity is a scientist, first gaining a BSc in Psychology before going on to earn a PhD in Neuroscience from Cambridge University. She added an MBA while on secondment to the pharmaceutical industry for four years. Professor Brown joined the University of St Andrews in 1993 as a junior lecturer and has risen through the ranks, holding prestigious international research fellowships and various management positions within the University. Two years ago she became one of the Vice-Principals, with responsibility for Enterprise and Engagement. In her talk, “How does a Modern Ancient work?” she described how the University of St Andrews is organised, managed and run. The University had 8,420 students as of the 2015-16 Semester 1, of which 6,763 were undergraduates. 43% come from outside the UK. It has very happy students – 97% rated themselves happy in 2015 and the University was ranked top in Scotland for student experience in the 2016 Times Higher Education Student Experience Survey and named University of the Year for Teaching Quality in the 2017 Good University Guide. The University came top in Scotland and 14th in the UK for the quality of its research publications in the UK Research Excellence Framework in 2014. The Guardbridge biomass plant is a finalist in the 2016 Scottish Green Awards. Only 38% of the University’s income comes from tuition fees and education contracts. Other major sources include funding council grants (21%), research grants and contracts (20%) and other operating income (20%), which includes things such as student halls of residence for students and conferences as well as university shops. In 2015-16, 55% of the University’s non-pay expenditure of £63.5m was with SMEs, of which around £6.35m was spent locally. Bidding for supplier contracts via the Public Contracts Scotland portal or the In-Tend e-tendering system. Advertising employment or internship opportunities via the Careers Centre, or using it to connect with students to raise awareness of your business or conduct market research. Ordering work from its Print & Design Unit. Holding or attending conferences at the University. Receiving specialist advice from the Playfair Consultancy Group – where top students get practical experience in subjects such as marketing by working on 10-week projects for SMEs and non-profits on a pro bono basis. Contacting the Business Innovation Manager at the University’s Knowledge Transfer Centre for help contacting University researchers about solving business challenges as well as funding via a voucher scheme. Verity also described fun ways in which people in the town can interact with the university, including its annual festivals, many of which began as University initiatives, membership of its Sports Centre, and taking short courses through the Open Association. While answering questions, Verity mentioned the vision for the Guardbridge Energy Centre site including the Sustainable Power and Research Campus – which will allow around 300 staff to be based outside the town centre alongside SMEs with whom they may work on projects.